How many people do you know have a knack for connecting with others? Very few of us are born with it. The rest of us have to learn it. How to Sell Yourself explains in clear, simple, easy-to-understand terms the skills you need to get your message across in any speaking situation. The secret of winning communication is likability. Some people call it warmth. Some call it charm. Some call it charisma. But whatever name you give it, it can be learned. This book is about how to use your mind, your face, your body, and your voice to win, because, in the end, likability wins. 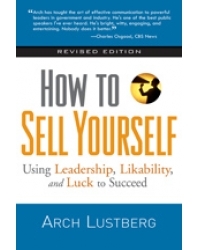 Arch Lustberg, acclaimed public speaker, teacher, and coach, has filled this book with practical skills. He demonstrates how you can sell yourself, your ideas, and your organization. The elected officials he coaches learn that you can’t sell your issues unless the voters like you. The Merrill Lynch financial consultants he trains learn that no one buys your product unless they like you. The National District Attorneys Association members he addresses learn that attorneys have a better chance of winning in court if they and their witnesses are liked by the jury. How to Sell Yourself is the last “how-to” you’ll need to win over a boss, jury, voter, legislator, friend, colleague, family member, or any group to which you’re talking. Arch Lustberg is one of America’s leading performance coaches. Lustberg’s client list is a Who’s Who of business leaders, elected officials, association executives, and top professionals in every field. He taught speech and drama at The Catholic University of America for 10 years, and produced both a Grammy Award-winning record and a Tony-nominated Broadway musical. Prior to founding Arch Lustberg Communications, he directed the United States Chamber of Commerce Communicator Workshops. His specialties include coaching for media interviews; delivering presentations; testifying in court or legislative and regulatory hearings; campaigning for office, a job or a promotion; and anything that involves memorably delivering your message.